First bike commute since starting my new job. I finally gave it a go. I rode a bicycle to my new job. It’s been a struggle to come up with a commute plan. I show up, grab a set of vehicle keys, and then I’m in the field all day providing medical appointment rides. If I have a late ride sometimes the office is locked when I finish up. If I have an early start I can’t even get in the main building to use a restroom. There is no secure place to lock up anything but a beater bike. However, there is a place to stash my folded up Brompton. This seems like a good use for my folder. At least for the non-snowy times of the year. Previous Article And more winter…. 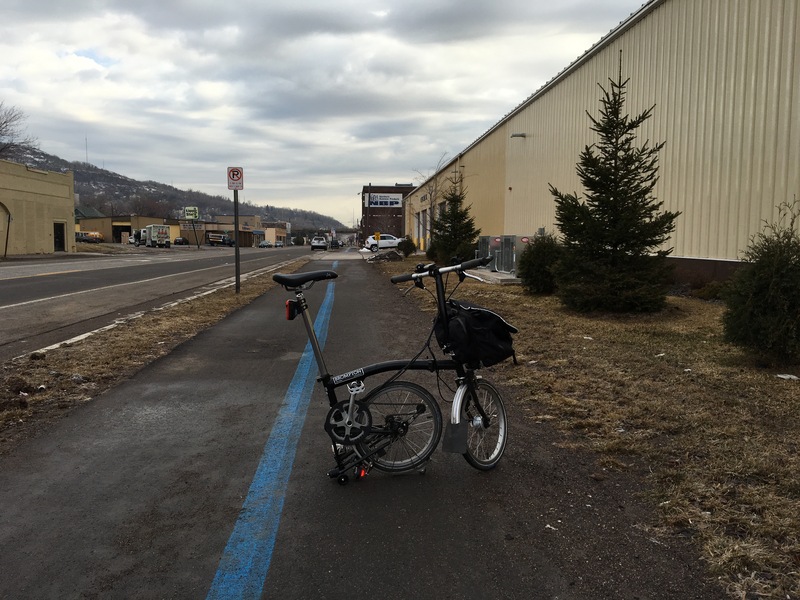 Next Article Commuting on a Brompton in the snow. Very liberating, I’m sure! Bravo. I was in your position about one year ago. It takes time to adjust to the new job duties then you acclimatize to the bike commute. Acclimatize is the word. After 14 years at the last job I didn’t realize I had a routine that helped me maintain the ability to ride everyday. It’s been frustrating trying to acclimatize to the new place. I do miss my bike commute. It’s the only thing I miss about work. I did have it good though. A locker, shower, kitchen, coffee club and a secure place to leave my bike. I also bought an iron and board to leave in the locker room. I kept a pair of shoes and would bring pants, shirt and socks in my backpack every day. I would cook eggs at home, usually over light, and at work I would nuke them, toast an English muffin and make a pot of coffee. Then I was ready to begin my work day. I’ve been telling people the only thing I miss about my last job is my commute….and some of the people. I realize now I had it good. Almost as good as you. I had a secure place to lock up, a place to change, a place to hang my sweaty/wet clothes, a kitchen. I too kept a pair of shoes at work and brought a change a clothes. Now I have none of that. It’s a been a challenge to get it all figured out. Hooray for sure! Funny that when I bought it in 2013 I wasn’t even sure if I’d like riding it, or what I’d use it for. I’ve used it for much more than I ever thought I would. And I really like riding it around town. It’s a fun little bike. And now it’s my best option for bike commuting to my new job. Yea for the Brompton. Glad you figured out a way to ride to work. What is it like driving around all day for your job? Have you had to adjust to that also? Or did you use to drive a lot at your old job too? In my last job I transported people maybe once a week. When I lived St Paul I worked for a vocational day program for people with disabilities. I spent 4 years taking a crew on a dry cleaning pick-up and delivery route. We spent all driving around the cities. It might sound odd to hear someone who hasn’t owned a car in 14 years say they love driving for a job. But I really do. It’s a lot different driving for work rather than driving to and from work each day. I only drive about 1,000 miles…… a year, and that is plenty for me. I don’t mind being in a car, as long as i don’t have to drive it! Despite the difficulties finding a solution to the commute, I hope you like the new job and it’s going well. Great to see! The Brompton comes through nicely. I had a Bike Friday Tikit for awhile, but life circumstances changed and I let it go. There are occasions when I think about how handy it would be to get a folder back into the stable. It’s great that you’re making it happen. Stay moving!